Perry is now a component of the fabric of human and biospheric history. He/she has recently been featured as the top story on the front page of the Mankato (Minnesota) Free Press, on Minnesota Public Radio, in television news stories on KEYC (Mankato), KAAL (Austin, Minnesota), and NBC (KARE 11 in the Twin Cities – story and video), as an extensive slide show and story on the WCCO web site (CBS Channel 4 in the Twin Cities), on CNN’s online program, and in this week’s St. Peter Herald. The Perry story has also been picked up by numerous other news outlets via a story through the Associated Press. A rough estimate of the total number of Perry visitors on Honors Day (May 5), the Saturday of Flowering (May 12), and the official visitation days (May 13 and 14) is something over 7,000 – about 7,200-7,500 people. At the last count of which I’m aware, nearly 160,000 unique web hits on the Perry web page had been recorded. Perry’s performance is not over. Keep up with the senescence of Perry’s inflorescence – but also watch for her/his reawakening. 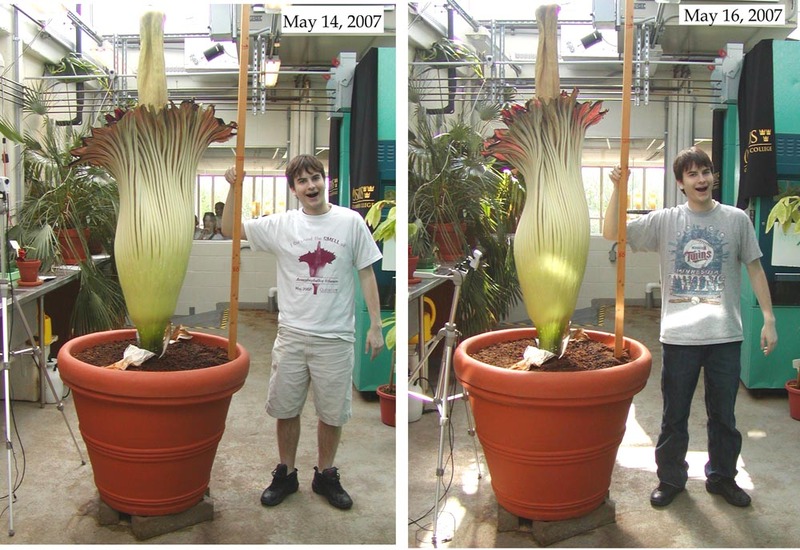 Perry, in his/her next phase, is expected to produce one of the largest leaves ever to exist in Minnesota. We plan to keep at least one webcam active for this process. Below is a thumbnail image of a couple of stages of Perry’s senescence, scaled to the usual model, Alex (Note: Alex does not actually exist – the model is made of plastic, and is readjusted slightly for each successive photograph for realism. For that matter, Perry never existed – the various versions of she/he are also miniature figures made of plastic). Click on the thumbnail for a larger version. Perry was on the evening news in Chicago the week before it opened. Thanks for the fun! It has been so exciting to follow over the internet! Was Perry pollinated so she/he can produce seed? If so, where was the pollen source from? I teach 7th grade life science in Austin, MN and we have been following Perry’s progress. It’s great to hear the item about the Chicago evening news. Do you know which channel that was? We collected pollen (see the “Children of the Corm” blog entry) for donation to other institutions where seed production is planned, but decided not to pollinate our plant because the stress of seed production will often result in the death of the plant, according to Michael Neumann of the Botanical Garden of Bonn. I agree–thanks for the fun! I’ve been watching Perry’s progress as have many of my friends and colleagues in the Twin Cities, Denver, Kansas City and other places. And I got to see it in person–how fascinating and exciting! It’s great to hear that you’ve enjoyed the flowering event, and also to hear of your far-flung friends who also followed it. Stay tuned for the leaf, and the next inflorescence.